Kidsbook Friends Gives Julia Rawlinson a Friendly Welcome! 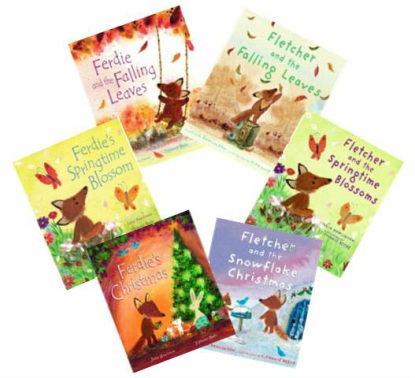 There’s no better way to “FALL Into Reading This Season” that to meet Julia Rawlinson, author of eight published books, including one of our favorite fall books, Fletcher and The Falling Leaves. We discovered Fletcher, a fun little heroic fox, a few years ago and followed him through his adventures in all four seasons. Tiphanie Beeke’s captivating illustrations and Julia’s creative style of writing, filled with alliteration, onomatopoeia & pure adventure, inspired my son & me in the writing of our first book together, Isaac’s Ice Cream Tree. I’m excited to go to my son’s school today and share Fletcher with his class (and a yummy fall treat). They will FALL in love with Fletcher and so will your kids. My Mum, Aunt and Granny all wrote silly poems to commemorate birthdays and holidays, so I grew up with a love of poetry – the first things I published were poems. I only started writing children’s stories when I had children of my own and became immersed in their world. I think I wrote my first children’s book manuscripts in about 2002. I was very lucky as two of those early manuscripts went on to become picture books. The first book was Fred and the Little Egg, published by Little Tiger Press. I have now had eight books published, plus lots of different versions and editions. I feel a bit disloyal choosing, but if I had to pick one it would be Fletcher and the Falling Leaves. It is the book that began the Fletcher series, which I have loved writing, and was the beginning of my partnership with the wonderful illustrator Tiphanie Beeke. The series now covers the four seasons – the summer book, Fletcher’s Big Show, was published earlier this year. I didn’t consciously base Fletcher on anyone, but I think he is probably a lot like me when I was a child. I spent many happy hours exploring Richmond Park, which is a beautiful big deer park full of foxes, squirrels, mice, rabbits and all the other Fletcher characters. Ideas come from all sorts of places. The ideas for Fred and the Little Egg, Fletcher and the Falling Leaves and Fletcher and the Springtime Blossoms came from my children – trying to hatch anything that looked vaguely egg-shaped; asking me to fix a fallen leaf back onto tree in autumn; and being swished through drifts of snowy blossom in a pushchair. A Surprise for Rosie began with a bouncy rhythm and Mule School started with the idea of a school where it was good to be disobedient (the more you think about it the more complicated it gets!). I have just written a couple of verse stories which began with rhyming phrases bouncing around in my head. I think writing my first draft of Fred and the Little Egg was quite quick, but at that time I hadn’t had any experience of writing picture books so I spent a couple of months exchanging messages with Little Tiger Press to get it into shape. Looking back at my emails I first met with Little Tiger in 2002, Jane Massey’s illustrations were completed in 2003 and the book was published in spring 2005. Go outside, look around and really notice things (when you have finished reading the book, of course!). I love receiving messages from people who have taken their children out exploring in the woods after reading the Fletcher books. Keep writing for the love of writing, not just to get published. I have written lots of stories and poems which have not been published as well as the ones which have been, and have loved writing them all. More specifically, if you are writing for picture books make sure there is plenty to illustrate on every page, and make use of page turns to add suspense to stories. Going for walks in the country, taking photos and, of course, reading. “The world was changing. Each morning, when Fletcher bounded out of the den, everything seemed just a little bit different. The rich green of the forest was turning to a dusty gold, and the soft swishing sound of summer was fading to a crinkly whisper. Fletcher’s favorite tree looked dull, dry and brown. Julia Rawlinson resides in Warwickshire, England with her husband and two sons. Inviting you to follow Kidsbook Friends on Facebook and subscribe to my blog at http://www.kidsbookfriends.com to receive kids’ book titles geared for ages infants to eleven. Each post features a kids’ book summary and review with 7 correlating questions, activities and/or crafts. This entry was posted in Author Interview, fall and tagged autumn children's books, children books for fall, children's book author interviews, children's book authors, Fletcher and the Falling Leaves, Harper Collins Publisher, Julia Rawlinson, Tiphanie Beeke. Bookmark the permalink.